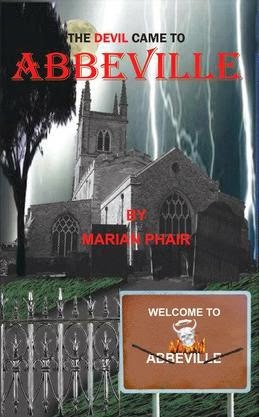 Marian Phair: Author : The Devil Came to Abbeville - Released! The Devil Came to Abbeville - Released! It has been a while and I apologise for the lack of updates but as you all know life doesn't stop! The last few months have been a roller-coaster but finally hitting the slow lane to start work on future projects. The Devil Came to Abbeville - my latest book has been out since Christmas though it has been a tough ride to get to this point. The Devil came to Abbeville is an engaging thriller about a vigilante serial killer. St in Abbeville in the modern age a town where dreams and reality end - nightmares come true! "One morning in May, a young girl covered in blood, staggered from a park and died in the arms of a priest. For DCI Jake Fletcher and his team, this was just the first a series of murders, with seemingly no connection. Then a white rose was discovered on the body of a victim, and again on the next. As the bodies begin to pile up in the mortuary the DCI enlists the help of a retired Criminal Profiler, Scott Holden, on vacation from the U.S.A.
Before long it becomes clear that there is more than one killer out there. The profiler knows the White Rose is the signature of a different killer. Somewhere out there is a vigilante, and he's Hunting!" The Devil Came to Abbeville is available in both paperback and e-book from Amazon UK and US, and Waterstones, ebook on Sainsbury's and also available to buy from Barnes and Noble for my American friends. Locally the Book is available to buy from WHSmiths in Rugby. Check out the reviews and find out for yourselves what The Devil Came to Abbeville means to you. Many thanks to all of you for your support. I so enjoyed the characters in this book. I cannot wait for more? I had difficulty putting it down. It made the rounds in this household and was discussed by all. Well done Marian Phair.